Paasche AIRBRUSH STARTER NAIL KIT is professional grade and designed with the manicurist in mind. With it you can decorate fingernails accurately, smoothly and easily. 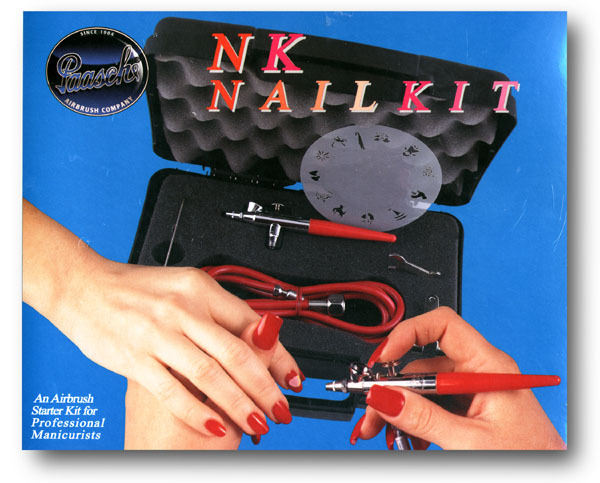 The Nail Kit includes a Paasche VJR2 double action, internal mix airbrush that is crafted from heavy-duty machined brass with a polished nickel finish and high impact plastic handle. Recommended air pressure is 20-45 lbs. PSI depending on tip size and fluid being sprayed. Use Right Or Left Handed. Paasche Airbrushes are Made In U.S.A.
Airbrush Nail Kit by Paasche. Minimum TOTAL Merchandise Order Is $10. To order an item, add the quantity you wish in the blank space provided. Then click on the Order button to add it to your shopping basket.